Jamba Juice serves up wholesome nutrition and inspires healthy living. Jamba Juice gift cards are the ideal way to share and enjoy a wide variety of master blended juices, smoothies, bowls and shots. The Jamba Juice gift card is redeemable in over 650 Jamba Juice locations in the US, is free from service fees and gift card funds never expire. 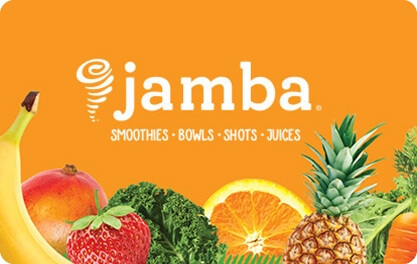 To check your balance, obtain additional terms or find participating locations, visit us at www.jambajuice.com or call 1-866-4R-FRUIT.